I can remember my dad being so happy when he would pull up to the table and mom would place a big plate of bright red peppers, standing on end and stuffed with "something". I also remember thinking with dismay, "I'm not eating that... yuck!" I could never figure out why dad was so happy, but he always cleaned his plate with gusto and ended the meal with a satisfied smile on his face. However! As I have matured (read: aged!) I have come to appreciate peppers of all kinds. Spicy green jalapeños and serranos, bright red and orange sweet globes, and my most recent favorite, the poblano. I love these deep green, somewhat heart shaped beauties roasted to bring out their flavor. Mild, they usually don't add much spice, just an extra layer complexity and a rich chili flavor to whatever dish you are choosing to use them in. Our local farmers market has had mounds of these shiny peppers for the past few weeks and I ended up with a bagful that needed to be used. Thumbing through Fine Cookings Weeknight Dinner edition the Roasted Stuffed Poblanos caught my eye. Was I brave enough to eat a whole pepper, not cut up into pieces and mixed with other ingredients? Actually eat the pepper as a vessel for the the stuffing? Yes!! And I'm so glad that I did. My husband didn't quite have the same happy look as my dad when he pulled up to the table, but he did push away with the satisfied smile and a comment that this recipe is "a keeper". Roasted on the grill before being stuffed with chicken, corn, tomatoes, onions and rice, and topped with a creamy layer of sharp cheddar cheese, poblanos do indeed make a wonderful vessel! The versatility of this dish makes a quick weeknight preparation easy as you can stuff the pepper with whatever you may have on hand in advance and simply warm in the oven when ready. I happened to have some leftover corn and rice in the fridge which turned out to be perfect additions to the sautéed chicken and tomatoes. As I pushed my plate empty away after eating the entire contents I sat back with a satisfied sigh and a smile. I guess I'm growing up... my mom will be so proud!! 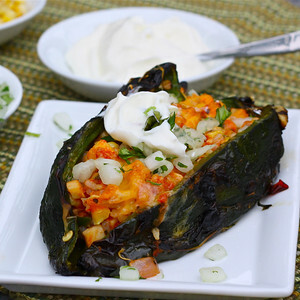 Before heading to our Stuffed Poblano recipe I wanted to announce RavieNomNoms as the winner to our first ever giveaway! Chosen at random by a mathematical formula derived by Liv (she and her brother both picked a number at random, added them together and then divided by 2), RavieNomNoms is the winner of a $45 gift card to the CSN Stores with merchandise ranging from end tables to cookware to pet Halloween costumes!. 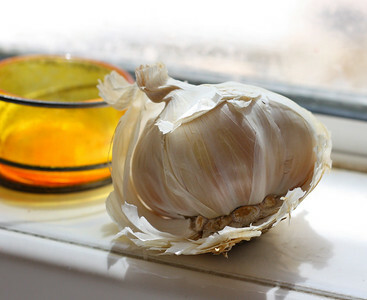 Liv had asked for a comment on "What food helps you to Liv Life in a yummier way" and RavieNomNom's food is garlic! Thank you to CSN for sponsoring this giveaway and allowing us to award the card. I'm sure it will be put to good use!! And hearty thank you also to everyone who entered and supported Liv's first ever guest post. She read each and every one of the responses and smiled at your comments. Congratulations RavieNomNoms! Preheat grill or broiler. Slit the chilis on one side (careful not to pierce the other side!) from stem to tip and rub with olive oil. Place directly on the grill grates or alternatively on a foil lined baking sheet under the broiler, turning every few minutes until blackened all over - 5 to 8 minutes. Let cool and peel off the skins and cut out the seed cores, leaving the stems on. Return the poblanos to the baking sheet. In a food processor chop the tomatoes with the garlic, oregano, cumin and salt to taste. Add the chopped ingredients to a large skillet heated over medium heat. Add the onions and corn or any other veggies you have on hand and cook until most of the liquid has evaporated and the mixture has thickened. Stir in the refried beans and lime juice and cook until heated through. Spoon portions of the sautéed mixture into the roasted peppers, wrapping the sides around the filling - leaving the top of the filling exposed. Broil the peppers until tops begin to brown then remove from oven and top with shredded cheese. Return peppers to the oven and broil for a few minutes until cheese is melted and bubbly. 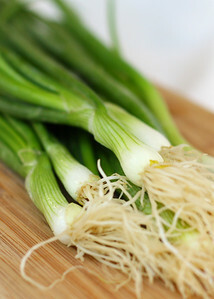 Serve with sour cream, a sprinkle of scallions and cilantro. We stuff peppers as well with rice and herbs. I love your stuffed peppers. I discovered how much I love poblanos this summer when I grew them in my garden on a whim. The same sort of reaction would happen in my family too! The filling rocks! I've never had stuffed peppers but if you say it's good I trust your judgement. :) The recipes that you share have all turned out so good. These would be great when we have people over because it's all held together in the pepper, has great presentation and something that most people will really enjoy! Congrats to Rav for winning!!! The aromas coming from the kitchen must have been sublime! I hope you do make it out to Peltzer farm in Temecula! Have a great weekend! I finished reading this article with a big smile on MY face. All peppers are up my alley but poblanos are the perfect - as you say - vessel for wonderful fillings. One of my favorites is the Mexican dish Chiles Poblano which are poblanos stuffed with cheese, and coated with an egg batter. I always spice mine up with some shredded chicken. Your recipe is so similar minus the egg batter and with the addition of a few wonderful ingredients! Reeni, I'm kind of obsessed with them myself! Laurie, we missed the Air Show this year... I'm so glad that was a good weekend. The "guys" flew over our house once, I always love that. My husband used to fly something similar so it's always fun for the kids to see. Thanks Matt! I'm smiling now too! I will have to check out your recipe... egg, huh? Will have to explore that one! Rice, beans, corn, and fresh vegetables stuffed into a delicious pepper shell. This looks (and sounds) scrumptious. I have come to love stuffing squashes and peppers over the past few years...I'm sure I would love this! Thank you for the kind words on my blog...your thoughts are so appreciated! I love that you first grill the peppers, then stuff them. It seems like that it would be the easiest approach with poblanos. They're stocked up the wazoo here, and I still haven't purchased any! At first I thought I'd have to wait until my husband got home to try this as I know my lil ones will stick up their nose to this delicious dish, then I read on our FB page that you can freeze these babies. So that's perfect on hectic nights for me when the children's palates are my focal point! Also, my husband always turns his nose up at stuffed peppers, so I've never cooked them before. But to me, they look so flavorful and as you said, so versatile! So if I can get him to eat cooked spinach, I can for sure get him to eat yummy stuffed peppers!!! I love the ingredients used in this dish, made my mouth water!! I am sure your dad would love these, too!!! I love stuffed peppers and this looks like a keeper. Gorgeous! I stuff poblanos too, most of the time with different cheeses and herbs and serve it with yellow rice or stuff it with rice and beans. ooo delish! I love stuffed peppers and poblanos are such a nice pepper to make all sorts of dishes with. We call stuffed peppers dolma and I was the same way about them the way you were! Unfortunately, I haven't grown to love cooked peppers any more since becoming an adult (aging). Your poblanos, however, are a dish my husband would fall all over for! Banana Bran Muffins - Our LivSTRONG submission!